Peanut Butter Pie is sensational. No kidding. Yet it is one of the easiest desserts that I make! Seriously. It starts with a graham cracker crust. Usually I make my own but I used a pre-made graham cracker crust this time. then you mix peanut butter, cream cheese, powdered sugar and whipped topping for the filling. 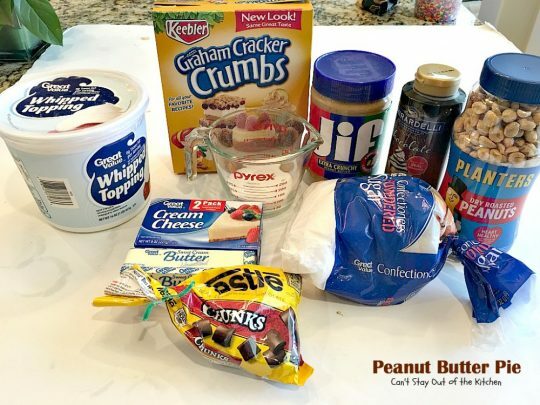 Top with more whipped topping and, if desired, chopped peanuts , chocolate chunks or curls, and chocolate and peanut butter sauces. I mean this is E-A-S-Y with a capital “E!” It is really overused nowadays to say a recipe is to die for. But this recipe is so, so, so good! Especially if you add all the extra goop like chocolate and peanut butter sauces, chocolate chips and peanuts on top. This is probably my husband’s favorite pie recipe. I got the recipe from someone at a Christmas party in the 1980s that we attended in Clearwater, Florida. When I compiled my cookbook several years ago, I couldn’t remember her name–one of only a handful out of hundreds of recipes given to me where I have forgotten who gave me a recipe. Probably because I only met the person the one time, and I wrote the recipe down on a napkin! Regardless, this recipe is not original with me, but delicious all the same. Sometimes I sprinkle the top with more graham cracker crumbs, but for these pictures I sprinkled it with chopped peanuts and chocolate chips. 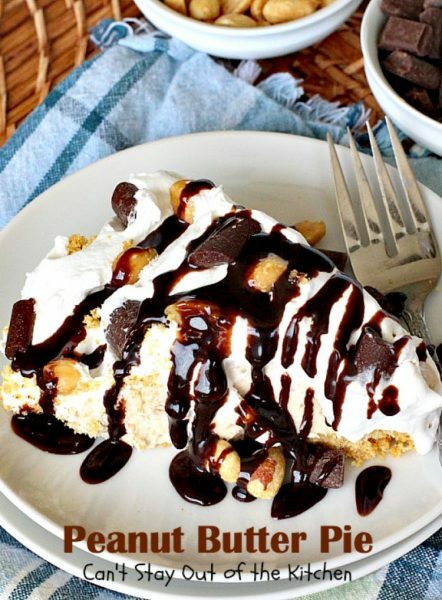 You can also add chocolate sauce, Reese’s peanut butter cups, chopped, use an Oreo cookie crust, or do any number of different creative things with this pie. I have also made it plain like this without all the toppings. Most people like to add their chocolate fix, but my husband also likes to enjoy the rich and creamy peanut butter and cream cheese filling in this pie without all the extra accompaniments. 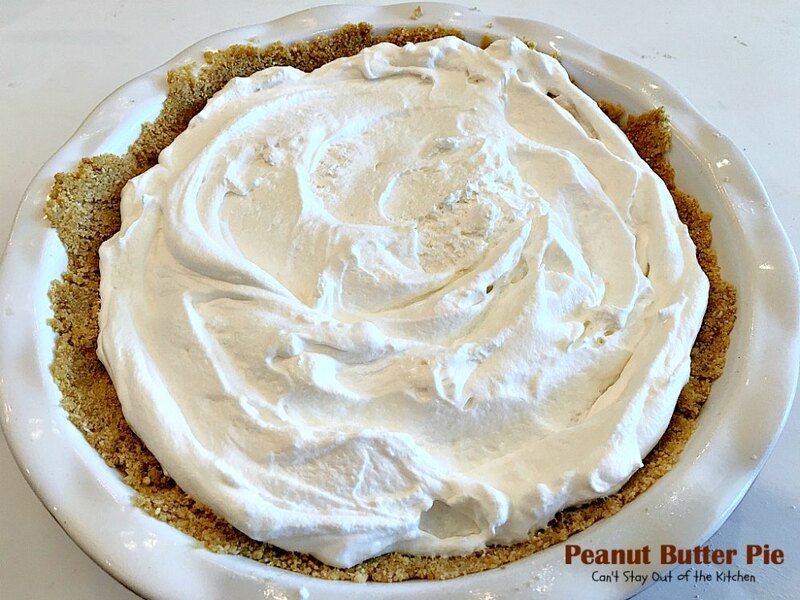 If you’re looking for a dessert to knock your socks off, then consider making up this easy Peanut Butter Pie. I warn you in advance it’s very rich, so a little will go a long way. When I initially made this dessert in June 2012, it was early days in my food blogging life. I was still taking pictures with an iPhone 3 so my pictures were a little blurry and dark. I’ve been remaking all those early first year blog recipes, and I recently (September 2016) remade this recipe for a New Member’s Luncheon at our church. 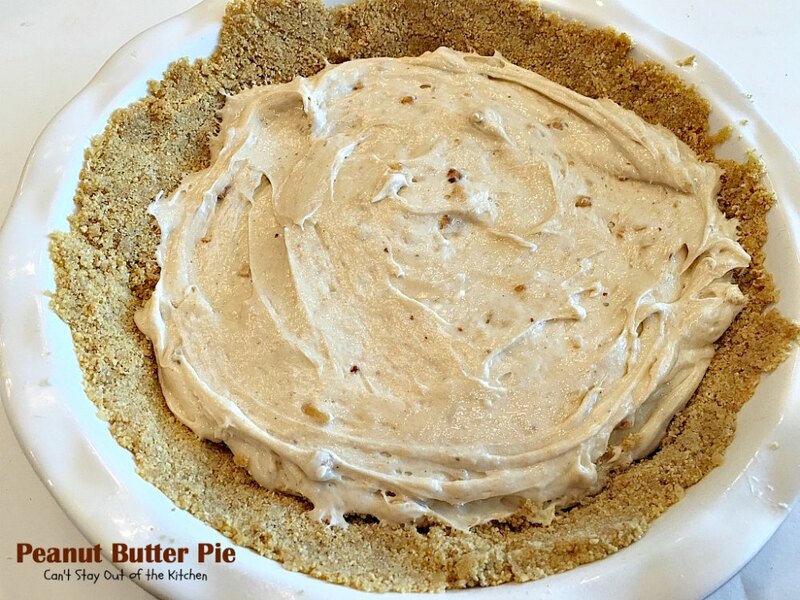 I made two of these Peanut Butter Pies and they were a huge hit. There was not a smidgeon left! Peanut Butter Pie is breathtaking. It goes fast! I used dark chocolate sauce, peanuts and chocolate chunks for garnish. Whether you serve Peanut Butter Pie garnished with Chocolate sauce, peanuts and chocolate chunks, or leave it plain, it is scrumptious each way. 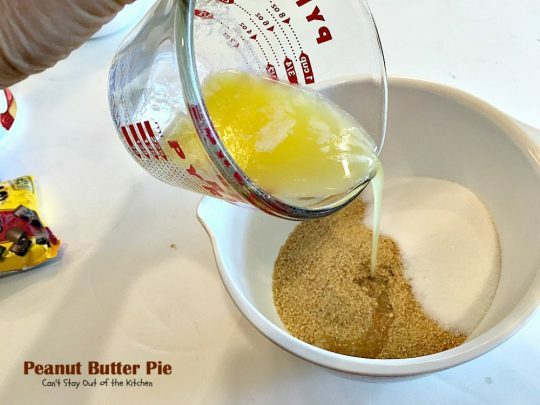 If you use a store bought graham cracker crust this dessert is even easier to make, although I made my own graham cracker crust. To make a graham cracker crust, place graham cracker crumbs and sugar in a mixing bowl. Add melted butter. Stir ingredients to combine and press into a large 10″ pie plate. Place graham cracker crust in freezer while working on next layer. Place softened cream cheese in a mixing bowl. Add powdered sugar, crunchy peanut butter and non-dairy whipped topping. 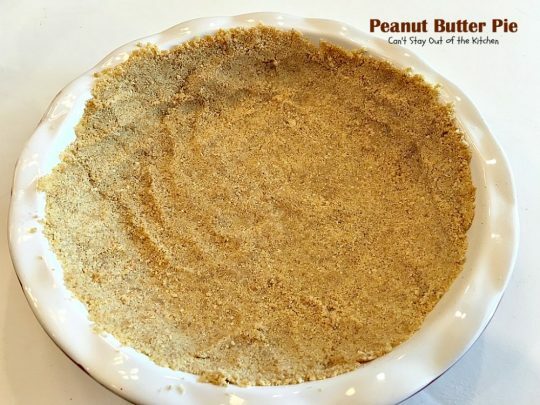 Remove frozen crust from freezer and place the peanut butter mixture in the pie shell. Place mixture in freezer again for about 30 minutes. 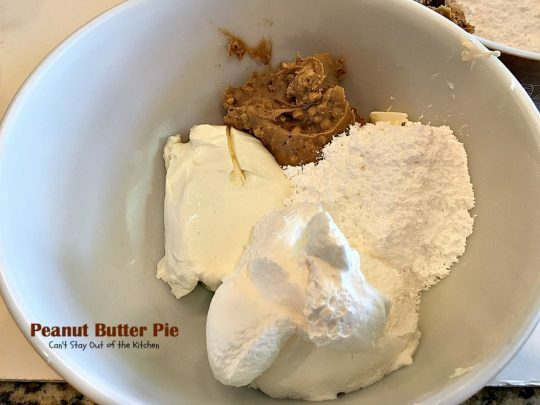 Remove pie plate from freezer and spread with remaining non-dairy whipped topping. Place in freezer again for about 30 minutes. 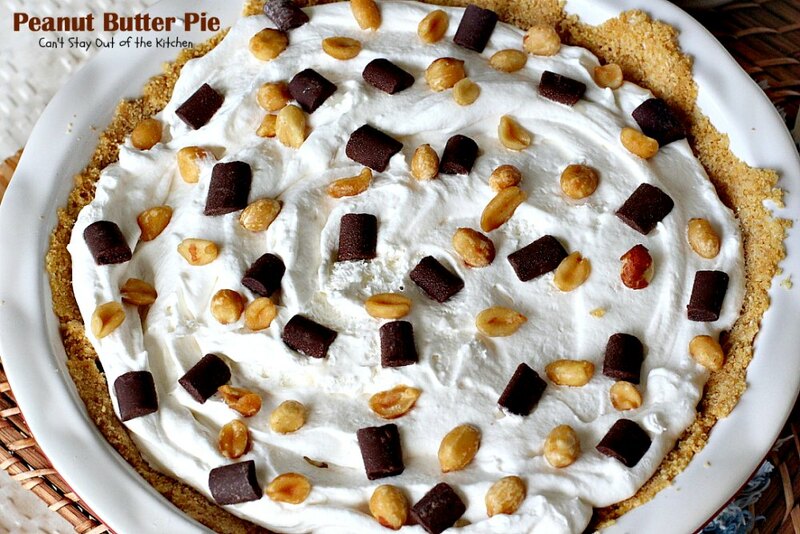 Remove pie from freezer and add peanuts and chocolate chunks. (You can also use chocolate curls if you choose). To serve, drizzle dark chocolate sauce over top of pie. Peanut Butter Pie can also be served without the chocolate sauce, if you prefer. 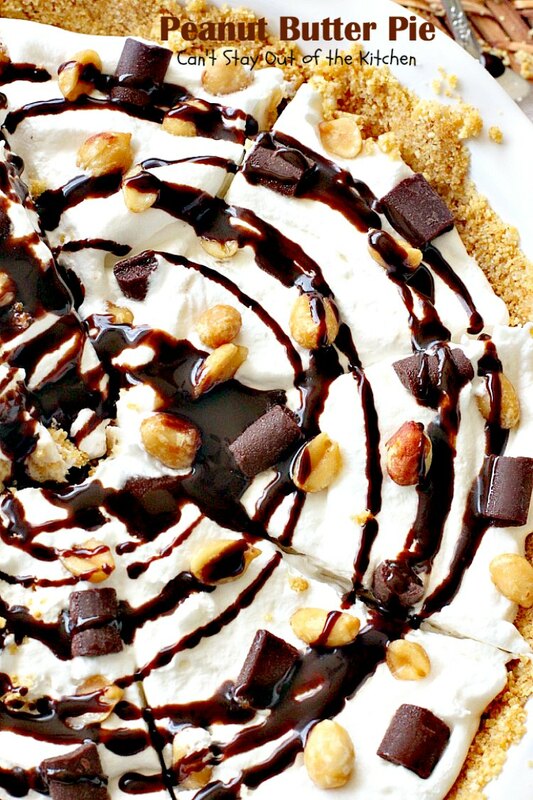 This rich, decadent pie is filled with crunchy peanut butter, cream cheese and whipped topping. Then it's drizzled with chocolate syrup and garnished with peanuts and chocolate chunks for one spectacular pie! Prepare graham cracker crust as directed place in freezer for about an hour. 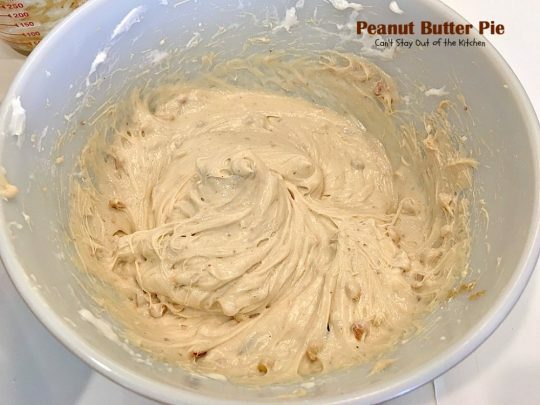 Mix peanut butter, powdered sugar, cream cheese and 1 cup of whipped topping with an electric mixer. Pour into cooled crust. Freeze about 30 minutes. Top with remaining whipped topping. Freeze about 30 minutes. Sprinkle chopped peanuts and chocolate chunks on top if desired. To serve: Slice into 8 pieces. Drizzle chocolate sauce over top, as desired. NOTE: If you double the recipe, put it in a 10x15" baking dish. Serves about 16. NOTE: I followed the directions on the Keebler graham cracker box and their ingredient list for my graham cracker crust. Instead of baking the crust, I froze it for one hour. NOTE: This pie can also be kept in the freezer until about 30 minutes before serving. 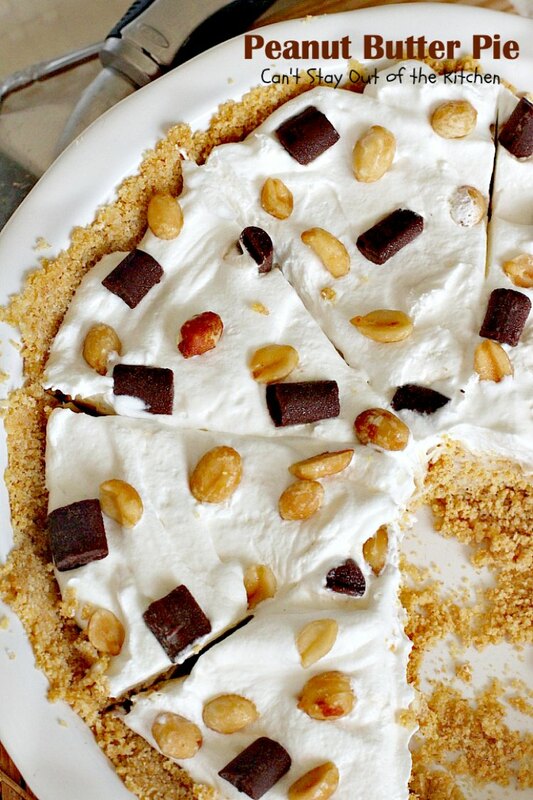 This rich, decadent pie is filled with crunchy peanut butter, cream cheese and whipped topping. 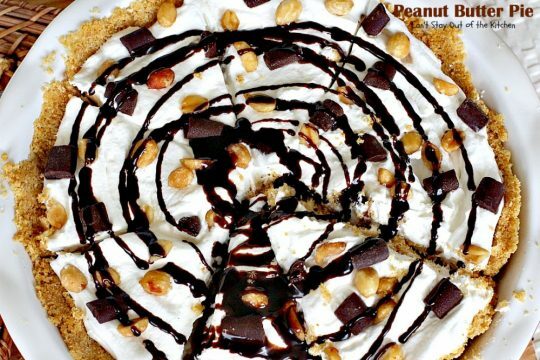 Then it’s drizzled with chocolate syrup and peanut butter syrup and garnished with peanuts and chocolate chips for one spectacular pie! Prepare graham cracker crust as directed and bake about 5-7 minutes at 350◦. Sprinkle chopped peanuts on top if desired. Sprinkle chocolate chips and halved peanuts over top of each slice. Then drizzle chocolate and peanut butter syrup over top, as desired. If you double the recipe, put it in a 10×15″ baking dish. It may take a little longer to bake the crust. Serves about 16. 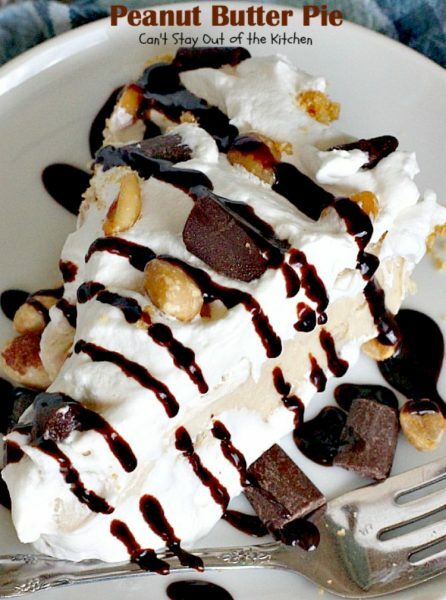 Peanut Butter Pie is so rich and decadent, it’s hard to get through a piece this size. 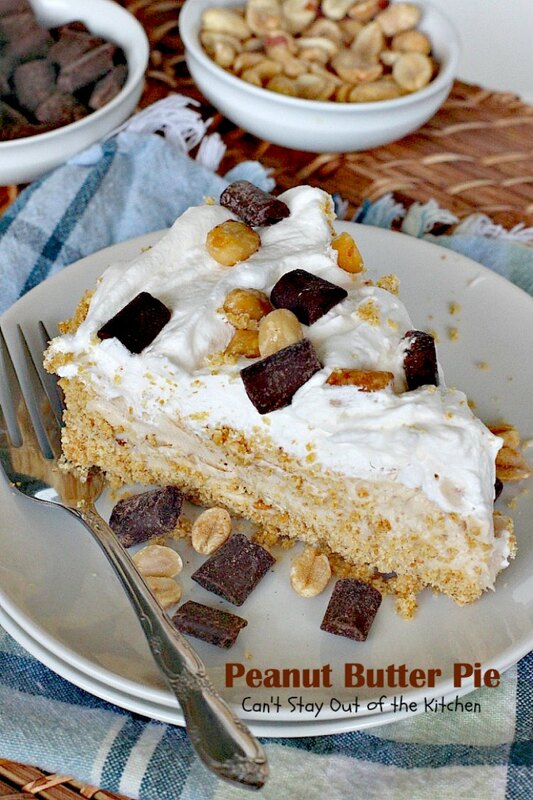 Peanut Butter Pie is wonderful special occasion dessert. We’ve served this for birthdays on many occasions! My husband actually prefers Peanut Butter Pie without all the sauces added on top. You, know I just ate beef stroganoff, why did I have to look at this? I thought I was full, but apparently not! This looks deeevine! It really is a fantastic dessert–John’s favorite. He likes it better without all the chocolate sauce so you can have it either way. Pretty easy to make too.